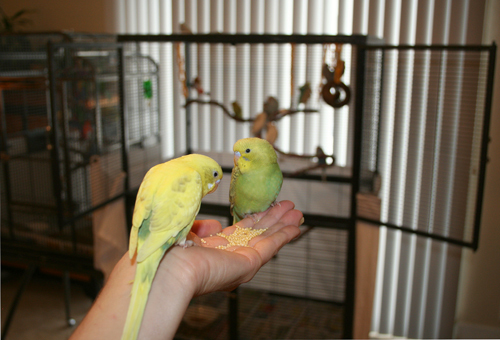 Family Raised, Hand Fed, Socialized Budgie Parakeets! 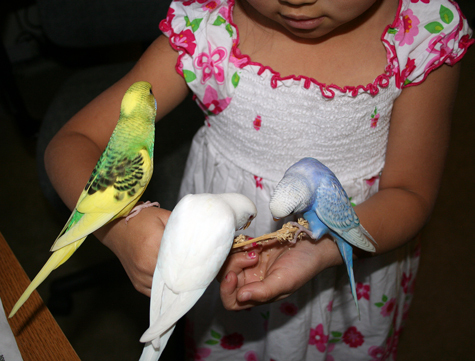 We are a small hobby budgerigar (budgie parakeet) breeder located in Fort Collins, Colorado. We raise three types of budgies: the small, agile American; the large, mellow English; and the moderate American x English cross (my personal favorite). Our small aviary is run by our family of three and the birds are raised in our home. 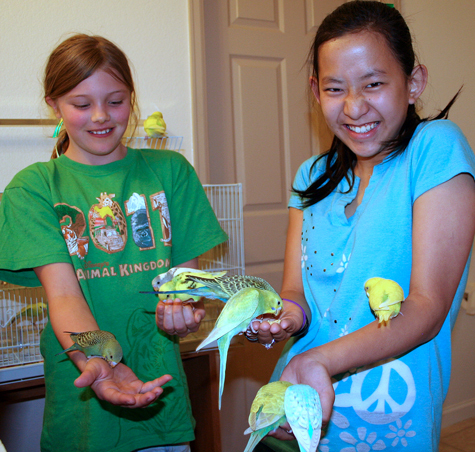 Our budgies are our beloved family pets and treated with the utmost respect and love. Our family is attached to each and every budgie as most of them have been with us since birth and have been handled from day one. We know and appreciate the personalities of all of our feathered friends. Our birds’ lives are filled with play, exercise, flight, nutritious food and companionship. 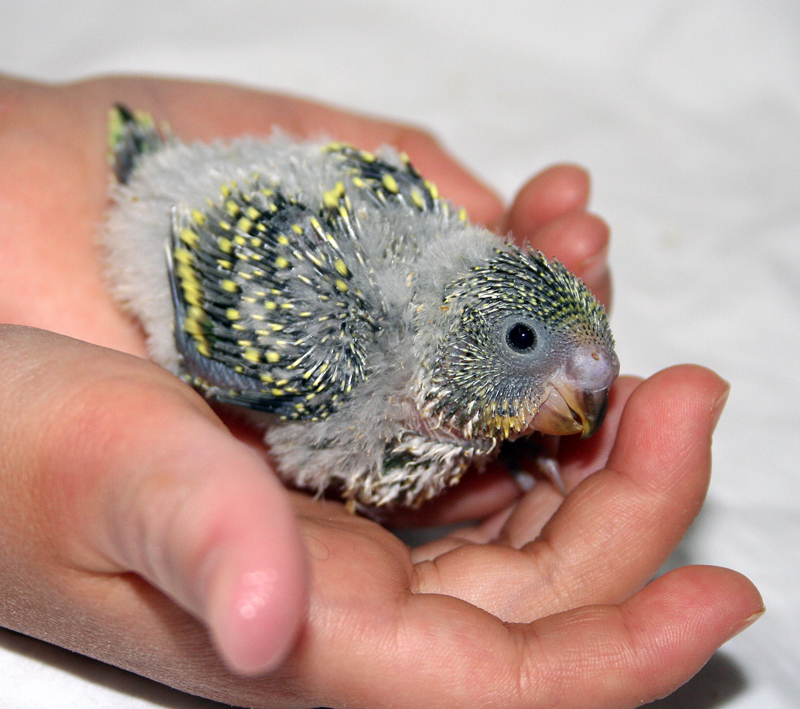 * Or send me an email so I can contact you once we’re raising baby budgies again. Even though our budgie parakeets are first and foremost our fun pets, we never breed them without a serious mind. Our selective breeding program focuses on health and temperament. Their beautiful color varieties and mutations are icing on the cake! We select birds with curious, confident and playful personalities to use in our breeding program because temperament and disposition has a genetic component. Then we either pull the chicks from the nest box when they are three weeks of age and lovingly hand-feed them around the clock, or, if both of the parent birds are tame and enjoy human interaction, we co-raise the chicks with them. Each chick gets fed, held and cuddled a minimum of 112 times before they go home with you! It’s one heck of a time commitment but the results are totally worth it. Take a look at the babies we’ve placed with new families — see for yourself how stinkin’ cute they are and how we raise ’em! Hand-feeding budgie parakeet babies is a HUGE time commitment. By the time they’ve weaned, we’ve fed, cuddled and smooched them at least 112 times! she is positively imprinted to humans at a very early age. Our primary goal as hobby breeders is to create the most lovable, well-rounded feathered friends. Therefore, we combine both nature AND nurture into our selective breeding program! When our babies are fledging (weaning, flying), we start training them to hop onto our hand, even fly to it when called. Their reward? Organic hulled millet, head rubs, and smooches! The babies are raised in our busy home office and homeschooling room where they receive hours a day of care, play and companionship. Our flight cages are huge and on rollers, allowing them to be rolled into adjacent rooms for a quick change of scenery. Exposing young animals to novel, positive experiences helps them learn how to handle stress better and grow to become more confident as adults. The more time the chicks spend in the company of humans, the more likely they are to include YOU as one of their flock! While the babies are learning to eat a variety of wholesome foods on their own, we continue to handle and socialize them several times every day. They eat dinner with our family, ride on our shoulder while we push the vacuum, and cuddle with us while we work on the computer or watch movies. We encourage them to come to our hand and step up on our finger. They are introduced to a variety of novel toys, places, people and situations and encouraged to explore. They are allowed the space and opportunity to learn to fly and safely navigate our home. Our baby flight enclosures and play gyms are located in our busy home office and homeschooling room where they receive many hours each day of companionship and care. No seed junkies! We wean our babies onto a wide variety of nutritious foods. We feed our budgies a wide variety of natural, organic and nutritious foods including organic sprouted seeds, legumes and grains; organic vegetables and fruit; mashed hard-boiled eggs; organic whole grain bread; organic baby food (made for humans); millet sprays; a wide variety of herbs and spices; and finally (and very sparingly) a seed mix. A fresh cuttlebone and a mineral block is always within their reach. This early exposure to foods (other than the seed-only diet typically fed to pet-store birds) creates birds who readily accept a varied diet that will increase health and longevity. Please read our Budgie Parakeet feeding recommendations and sprouting directions for details. We “abundance wean” our babies which means that rather than arbitrarily pick a convenient date and rush it, we allow them to tell us when they’re done with our supplemental formula feedings and ready to eat 100% on their own. Typically our babies are ready to go to their new homes when they are 6-8 weeks of age. How long does the laying, hatching, hand-feeding and weaning process take? Tiny, pink babies hatch from tiny eggs. We let momma bird feed them in the nest for the first 3 weeks, then we take over with around-the-clock handfeeding so they grow up tame, tame, tame! Once a breeding pair is placed together in a separate flight cage with an attached nest box, they typically spend 2-3 weeks bonding, then mating, before the first egg is laid. The hen (momma parakeet) lays one egg every other day until she has 2-8 eggs in her clutch (4-6 is typical). She incubates the eggs (lays on them to keep them warm) for 18-21 days until they hatch. We let the hen feed her tiny hatchlings for the first 3 weeks so they get a good dose of the immunities found in the hen’s crop milk. Then we remove the babies from the nest box, place them in a temperature controlled brooder, and give them round-the-clock hand-feedings, care and affection for another 3 to 5 weeks. Therefore, assuming all goes well, we have tame babies weaned and ready for new homes 12-15 weeks after the breeding pair is put together (9-10 weeks after eggs are laid). 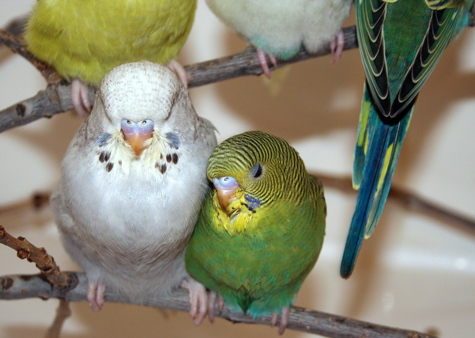 Budgie parakeets are highly social animals and crave companionship. 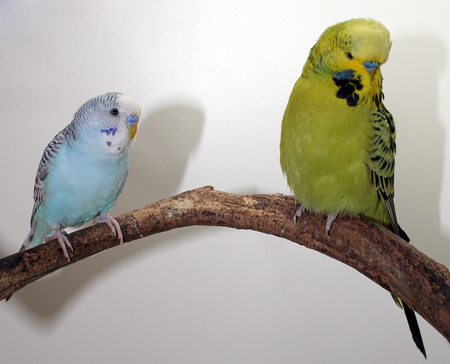 American Parakeet (left) compared to an English Budgie (right). Same species, just different types. And yes, the two types can live together in the same cage — these two are best buddies in our aviary. While waiting for your “Budgie Stork” to arrive, please read our care instruction page. Also take a look at the cages, foods and supplies we offer just for our adopters! 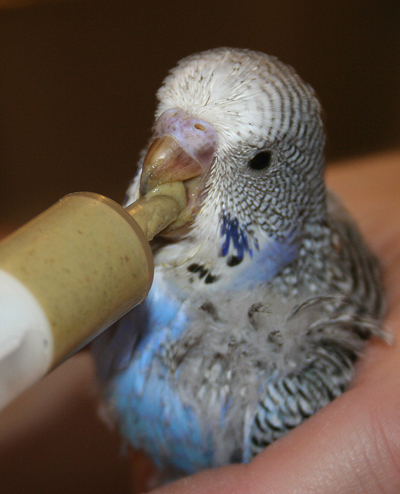 Most budgie parakeets are weaned and ready to move to new homes when they are 6-8 weeks of age. Sorry, no shipping. Pick up is in Fort Collins, Colorado. Please let me know when you may have a hand fed baby male parakeet (tame) to purchase for my husband. Our last beloved parakeet died a couple months a go and we would like very much to have another one. We’ll put 3 pairs together later this week. Babies are ready for homes about 9 weeks after eggs are laid. Be patient — the handfed babies are worth the wait! So sweet and loving; you’ll have a great pet for up to 15 years! I live just north of Fort Collins and came across your website last evening and your birds are just beautiful! I loved the one right after their shower!! How colorful they are…almost like a painting! I live alone, no other animals in the home. I have had dogs, cats, birds, rabbits,etc. most of my life. Unfortunately, last week I had to put my cat that I had for seven years, to sleep. I love animals! I have decided now that I want a bird again. I have had a parakeet in the past. I would like to know if you have any available now, even a rescued would be great. Thanks you much for your time! Awaiting your reply. Barbara and Sandi, I will send you an adoption questionnaire via private email. You have a wonderful website! I’m wondering if you could refer me to a breeder with similar philosophies as you in the state of CT? I have been looking through classifieds & websites & I’ve yet to find someone who hand feeds, allows full flight & feeds a varied diet to their weaned babies, let alone one of those things! Please tell me you know of someone near me!!! I don’t know any breeders in CT, sorry! Have you tried finding a local bird club? Ask them for a reference. Best wishes! Well I’ve been looking & there seems to be slim pickings in my area! Where did you get your first birds to breed? Sorry to hear about “Cloudy Too”!! Hope she makes it her next chance. Wasn’t there other Mommies & Daddies to be?? I keep checking in but Don’t see an update on the Parakeet breeding progress….any news? I have sent an email to your jen@puppies email addresss. Interested in a parakeet!!! yay! Please send me more info and adoption pages. How do you get a Spangled Opaline? What are the parents to it. Hi, i got a baby budgie yesterday from someone who just didnt want him. From what i have read on the net he looks to be around 23-25 days of age. The problem is, i cant get him to eat… ANYTHING! Can you help me? He is very quiet, very still and is in a cage with 3 sides covered. Eek! 23-25 days of age is too young to be weaned! Are you sure it’s that young? If it is, yes, you will need to hand-feed it with bird handfeeding formula. If you haven’t done it before, please get a local avian vet or bird breeder to help you and show you how. If you live in Fort Collins, I can help. Let me know ASAP. I’m very interested in one of your tame hand fed parakeets for my 8 year old. She is buying it with her own money. How much are you asking and when will some be availible. Im trying to find a parakeet for my daughter’s 4th birthday. A few weeks ago our neighbor found a white and blue parakeet in their yard. My daughter fell in love with it and named it Angel. Unfortunatly it died overnight (it was very small and could barely fly) and she was devistated. Im trying to find 2 new parakeets for her. Will there be any available still in/by June? I am 13 and desperately want a Parakeet! As soon as I found this website I knew that these birds would be way better than the ones from petsmart! The only thing is that I am about four hours away and my Mom has been driven crazy by my non-stop babble about parakeets and will most likely not drive me there. I am also worried about the travel home (if I were to go). I just don’t know if they are going to be very happy spending four hours in the car. I am not sure how the shipping works but if you make any exceptions please notify me! Hi! I’m Paige and I’m 8 years old and fell in love with birds (mainly parakeets) around October in 2011.I would also like to ask you what age you think is good for owning a parakeet? Thanks so much! Please reply! Hi I’m Paige and I fell in love with birds (mainly budgies) around October in 2011. I would also like to ask a couple questions 1. How hard is it to care for a budgie? 2. What age should you be to own a parakeet? Thanks so much please reply!!! I raise my parakeets the same way you do, but I have one English Budgie that is going light. He eats the food and it settles on the right side of his lower abdomen and then he vomits it up before he eats again. He is wafer thin and I don’t know what to do. The avian vets cannot find out what’s wrong. I was told it could be an iodine deficiency and to give him liquid kelp in his water. I have all my birds on a good probiotic from Avitec. They get the best care and foods. Have you had any experience with your birds going light. It’s heartbreaking to watch. I’m going to try some herbal supplements from Avitek and the Liquid Kelp but I would appreciate any advice you could give me. Thanks. My boyfriend and I are looking for a baby parakeet to be our companion. I am on a device that is difficult to use. So, if you could email me, with a questionnaire, as well as information on prices, that would be great. I would like to get one – Yellowface type 2 American parakeet….which shows on your web. Please let me know if this bird available for sale. I currently have a beautiful young blue parakeet and am looking for a friend for him. 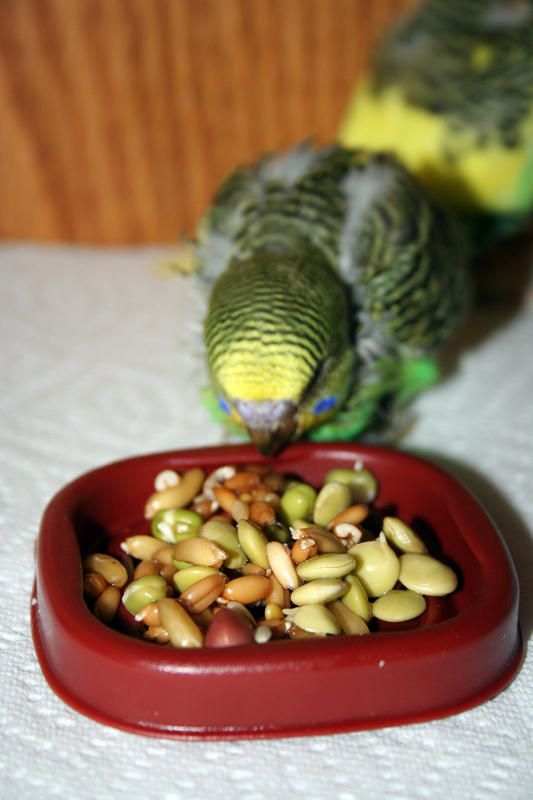 Have had keets all my life and serve non- seed food ie sprout and pellets, and veggies and sometimes a little fruit. If you have a bird for adoption please consider me. Do you still have the two parakeets available? Hi. I was totally excited after reading your website and was ready to order a pair of budgies. You guys sound like perfect breeders for the 2 lovable babies we are looking for. However I was crushed when we read that you do not ship. Do you know anyone within a 100 mile radius of New Orkeans that has the same philosophy as you with regards to breedings? Thanks & continued success. please let me know if you hv any baby budgies or will soon? I just lost my Violet and her best friend Victor is devastated as we both are. please help me. we are both so very very sad.He needs a friend. Hi, I’m 12, and I really want a small, blue, hand fed, tame, playful, and quiet parakeet. Please let me know when you have a fledgling that fits the bill. Also, I am kind of short on time, so I think it would be less work having one parakeet, but I don’t want him to be lonely. Help? 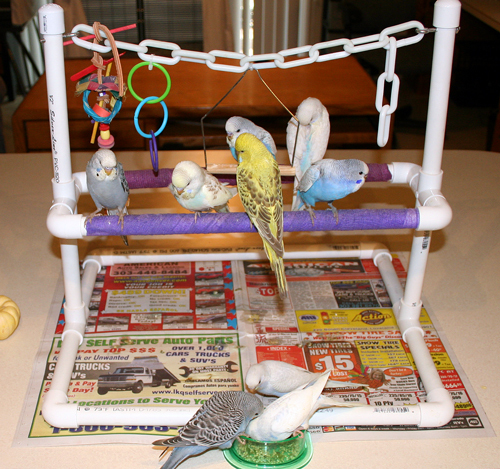 Our specialized budgie breeding program is currently on hold. We plan to resume after we move to a new home, hopefully during 2016. I will update my website and Facebook page accordingly once we’re up and running again. Thanks for your interest and patience. Hi, I have American Parakeets, I have had them about 5 years ,boy and girl birds. She has laid about 20 – 30 eggs over the last few years, none ever resulted in babies. Recently she layed 4 eggs, one she broke open, the rest for the first time ever she is sitting on them, something she has never done before. I was just wondering why the mail bird has started laying with her ? He gets real close and is actually laying with his head on her back . Is it because he misses her, she does spend most of her time on the eggs. I have watched lots of videos , but never saw that in any of them. Typically the hen will incubate the eggs and the male will feed the hen. Once the chicks hatch, the male will often enter the nest box to help feed the babies. Breeding pairs differ in their levels of cooperation. A couple words of caution: At 5 years old, laying eggs and raising babies is especially hard on the parent birds. Make sure you are offering plenty of nutritious, fresh foods and calcium. I would do everything in my power to discourage the hen from laying again — remove the nest box, rearrange the cage, shorten the daylight hours in the room, etc. Best wishes! Sorry, I don’t ship (pick up is in Northern Colorado). I have a search bar tool on my page – for instance, you can enter “cinnamon spangle” and find a few photos scattered throughout. You can read about ceres here: http://puppiesareprozac.com/budgie-parakeet/as-pets-faq/#How_do_I_tell_a_male_from_a_female_budgie_parakeet. 2 males will feed each other as well, especially when they are young.